Basic idea of the programme is to get an opportunity for the entrepreneurs of the region in the field of food processing, agro-forestry, bio resource utilization, packaging solutions to have exposure to Japanese technology in the industrial fields. The main topics for discussion of the sessions were Bio Resource in North East, Agro Food Science Technology, Food processing & Packaging and Organic Waste Recycling. The program was organized in two session, in first phase the topic was Prospects in Agro-Energy & Developments in Food Sector, where Prof. G.J.N.Rao Indian Institute of Technology and Dr.Vimal Katiyar, Indian Institute of Technology along with few local entrepreneurs gave their insight on Agro-Energy opportunities. The Japanese delegation was comprised of Academia & research, namely Prof. Fumiaki Suzuki Vice-President of Gifu University, Dr. Nobusuke Kobayashi Associate Professor, Gifu University, Prof. Daisuke Shibata Chief Scientist, Kazusa DNA Research Institute & Kyoto University and Hideyuki Hara Research Associate, Mitsubishi-Chemical Foods Corporation who gave detailed presentation on the topics. In the second session, Dr. S. Uma, Director of ICAR National Research Centre for Banana, Tiruchirapalli, Dr. Kartik K. Samantha, ICAR-National Institute of Research on Jute and Allied Fibre Technology, Kolkata along with local entrepreneurs gave their fruitful suggestion for valorisation of Bio resources in North-Eastern region. Keshab Mahanta, Hon’ble Minister, Science and Technology, Government of Assam was the Chief Guest of the programme. V.S. Bhaskar, IAS Additional Chief Secretary, Science & Technology, Government of Assam and Dr. KVR Murthy, Chairman & Managing Director Jute Corporation of India were the Guest of Honours. Dr. Arup Mishra, Director of ASTEC and Shri Manoj Das, Director of IIE attended the programme as special guests. 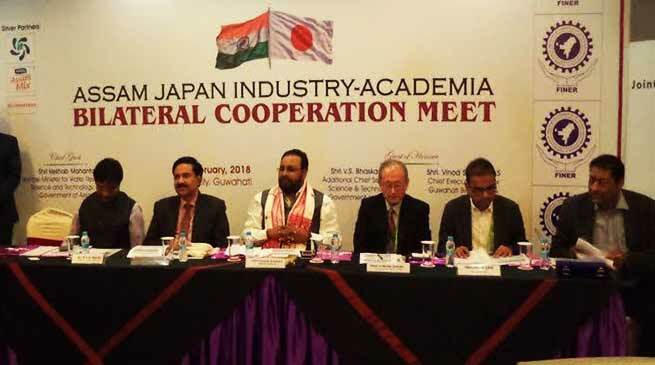 The event was a grand success with large number of delegates from Japan, Industrial Units of Assam, IIT and Guwahati Biotech Park attending the programme.